Vortex Generators are small attachments made from durable material that energizes the flow around the blade and reduce flow separation. Wind turbines often face the challenge of balancing between manufacturability vs efficiency. As a wind blade’s design cannot be, exclusively aimed at maximizing aerodynamics, some design compromises can lead to aerodynamic stall, which causes a reduction in efficiency and lower annual energy production (AEP). Furthermore, surface roughness and leading edge erosion can amplify the issue. Unfortunately, these losses in efficiency can impact the bottom line for the wind turbine owner with untapped potential compounding throughout the years. As an industry leader in wind technologies, 3M is consistently looking for innovative solutions to help maximize ROI and the efficiency of wind turbines. 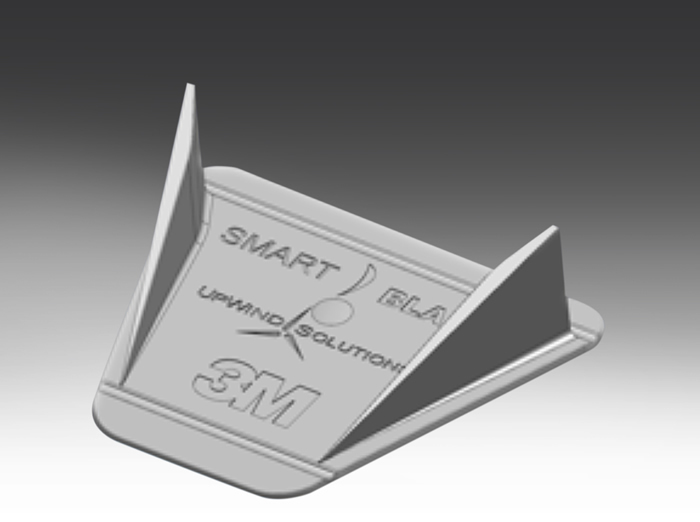 In consequence, the company partnered with UpWind Solutions and Smart Blade to create an advanced design and installation process for vortex generators (VGs). 3M™ Vortex Generators are small attachments made from durable material that energizes the flow around the blade and reduce flow separation. Due to the unique shape and properties of every wind turbine blade, VG and its positioning should be customized for each blade design. The placement of 3M VGs on the blade is determined using a proprietary analysis process and flow visualization analysis to provide the best performance increases. When properly designed and installed, VGs have the potential to be a cost effective investment for turbine owners. A 2014 paper by UpWind Solutions reported the results of a study analyzing 85 turbines. After comparing data from pre- and post-installation, it was demonstrated that 3M VGs enhance AEP by 2.2%. The paper calculated that when this AEP increase is applied to a standard wind farm with 60 GE 1.5MW turbines, a VG installation could pay for itself in as little as 1.77 years. In an effort to increase the effectiveness of VGs and produce the results mentioned above, 3M partnered with UpWind Solutions and Smart Blade to leverage each company’s respective strengths – materials expertise, aerodynamic proficiency and installation accuracy and efficiency. Ultimately, although VG technology has been on the market for many years, reliability has been a limiting factor to the product’s success. To address this concern, 3M™ Vortex Generators are made from a thermoplastic material that provides high durability, dimensional stability, strength, and weather resistance. Additionally, to attach the VGs, the system uses 3M™ Acrylic Foam Tapes which provide a key component for proven success. 3M Acrylic Foam Tapes can accommodate the flexing and residual forces acting on the blade surface while still providing very high adhesive strength in challenging weather conditions. This attachment solution also gives the VG the ability to better withstand variable forces and temperature changes. Due to recent advancements in vortex generators, OEM’s can finally get the maximum performance from their wind turbines and experience an appreciable boost in AEP with minimum downtime. Most importantly, VGs are an economically viable upgrade that can maximize ROI and reduce the costs associated with wind energy, making wind energy affordable at every turn.